Lochen Dharmashri (1654-1717) was born into a family (the Nyo lineage) in which there was a long tradition of great Buddhist teachers. His father was Sangdag Trinley Lhundrup, and he received the Refuge and Bodhicitta Vows from Terdag Lingpa, his elder brother and principle guru. When Dharmashri was fifteen, he received novice monastic vows from the Fifth Dalai Lama and full ordination when he reached the age of twenty. Fulfilling the instruction of the Dalai Lama, he later received the pure lineage of the Lower Tibetan Vinaya of the Nyingma and became a great preserver of this tradition, widely propagating its explanation and practice. 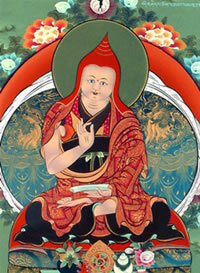 Lochen Dharmashri authored one of the most famous treatises of the Nyingma School, the Lochen Kabum. These 24 volumes of his collected works begin with his unprecedented writings on the intentional meaning of The Sutra Which Gathers All Intentions (‘dus pa mdo) and the Magical Net (sgyur ‘phrul drwa ba), in the form of great commentarial expositions. His commentaries on the Guhyagarbha Tantra – The Adornment of the Enlightened Intent of the Lord of Secrets (gsang bdag dgongs rgyan) and The Oral Instructions of the Lord of Secrets (gsang bdag zhal lung) are famous for their clarity and eloquence.